The Corvaro oriental lily has bold red petals accented by a delightful thin outline of white on delicately ruffled edges. 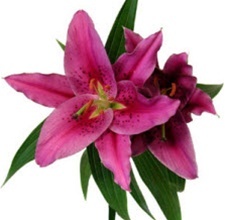 The Corvaro Lily has deep red freckles; lime green center star, pistil and filaments topped with copper anthers. We guarantee freshness. Free Shipping! Bold red petals accented by a delightful thin outline of white on delicately ruffled edges. Deep red freckles; lime green center star, pistil and filaments topped with copper anthers. Seasonal availability. Prices are based on availability and are subject to change due to weather and market conditions.